and the surrounding area has experienced record flooding along the Missouri River. Google has a data center in Council Bluffs, along with many employees that live in the city and surrounding region. 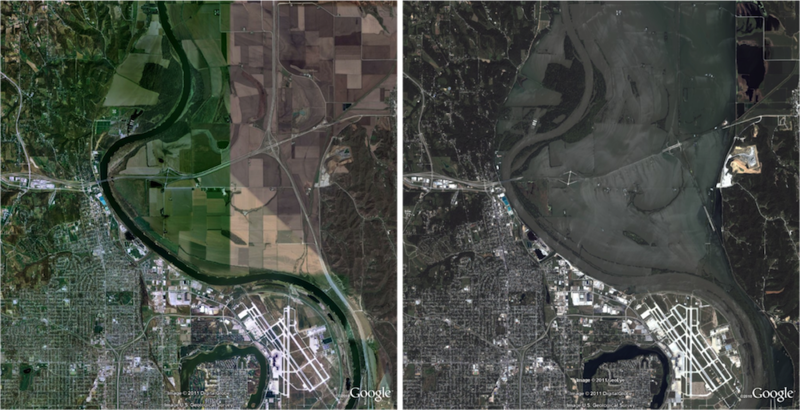 Along with our neighbors, we watched with concern as the Missouri River rose to a level not seen in decades. We are grateful for the extraordinary work of the City of Council Bluffs, Pottawattamie County, the Army Corps of Engineers and others who kept the city and much of the surrounding region safe. Our hearts also go out to those who have lost homes and businesses to the rising waters. We recently worked with our satellite provider, GeoEye, to acquire updated imagery of some of the affected area. This imagery is now available as a KML file and will be live in the Historical Imagery section of Google Earth in the coming days. We hope that it will be of use to emergency responders and the general public. 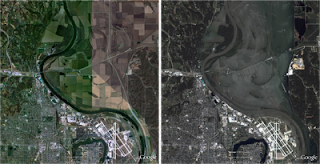 You can access all the new imagery by downloading the KML file and opening in Google Earth. Since June of 2011, Council Bluffs, Iowa and the surrounding area has experienced record flooding along the Missouri River. Google has a data center in Council Bluffs, along with many employees that live in the city and surrounding region.